This ČSD 310.0118 – ex kkStB 97.27 – is currently on display at the National Technical Museum, Prague, Czech Republic – photo taken on July 17, 2003. …and another picture of the same engine, taken on April 29, 2009. … and original manufacturer’s plate on this machine. 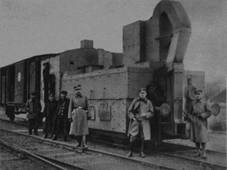 Poor, but very interesting photo of an armored TKh12 from P.P.17 ‘Saper’ armored train; source: http://republika.pl/derela - thanks for permission! 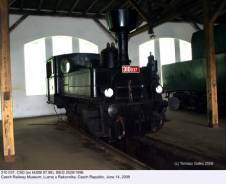 310.037 (ex kkStB 97.98, StEG 2528/1896) is a part of the collection of Czech railway museum at Lužna u Rakovnika; photo taken on June 14, 2008. 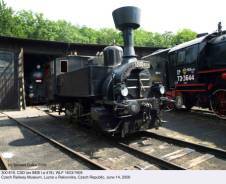 Another engine from Lužna: 310.619 (ex BEB I.a 419, WLF 1633/1905), photographed on the same occasion. Note shorter water-boxes. KkStB 97.152 (Krauss Linz 3822/1898) was converted into a test engine by BBÖ and re-designated 69.02. This explains the unusual axle arrangement. In this form it is on display at the Heizhaus Strasshof; photo taken on June 20, 2009. Poor, but interesting pre-war photo of a TKh12 – number unknown, it seems there is no designation. Probably this machine was used by a local railway, but no details on date and location are available. Makeshift spark arrester is noteworthy. Source: National Digital Archives (www.nac.gov.pl). Used by permission. 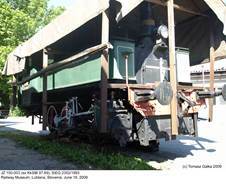 JŽ 150-003, former KkStB 97.69 (StEG 2352/1893), dumped at the premises of the Slovenian Railway Museum; Lublana, June 18, 2009. Operational Czech 310.006 (ex KkStB 97.20, WrN 2371/1879), photographed at Neratovice on June 13, 1999. Postcard from my collection. 97.73 (StEG 2404/1894), plinthed in Linz, September 28, 1987. Photo by Ernst Wolf (frm my collection). 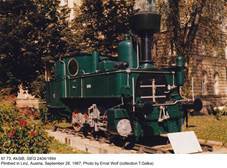 In 2001 this locomotive was transferred to Heizhaus Strasshof. 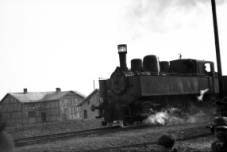 In Austro-Hungary there was always a need for small, but comparatively powerful tank engines for local and branch lines, many of them running in mountainous regions with steep gradients. One of the most widespread machines for such perhaps inglorious, but important duties was class 97, which appeared in 1883. 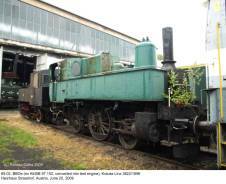 It was a simple, three-axle single-expansion engine with water boxes extended forwards up to the smoke-box door. 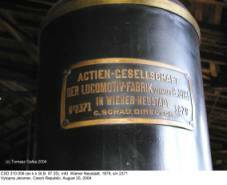 Manufacture of this type, at Krauss Linz, StEG, Wiener Neustadt, Floridsdorf and BMMF (aka PČM, after its Czech name), lasted until 1911. According to data provided by Josef Pospichal (thanks a lot! ), 228 examples were built, but as one of them (97.19) was written off as early as in 1910, most sources – e.g. EZ – give 227 machines. Several of them were supplied to local operators, but most (after 1888, all) had KkStB service numbers, so the conjecture that total number was higher, which can be found in many sources, is erroneous. As the highest service number was 97.255, some sources give 255 as the total output. 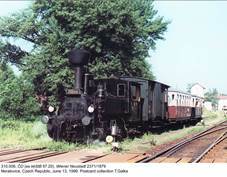 - BEB (Buštěhrad railway) class I.a: 22 engines, plus one more for Vojkovice-Kyselka local railway, built between 1890 and 1906, later impressed into ČSD service as class 300.6; they had shorter water boxes and larger boilers with pressure increased to 12 bar. These machines were still very useful after WWI, despite obsolescence of their design. The majority went to Czechoslovak state railways (ČSD) – initially 135 examples, designated class 310.0, plus several more (possibly seventeen) for various local and industrial lines, with service numbers from 310.901 to 310.917 (three later incorporated into class 310.0). With growing demands, due to increasing weight even of local trains, many were withdrawn before WWII and sold to industry or scrapped. The last one – 310.097 – was used for switching until 1968. Several machines served with Romanian railways CFR (29 – designation unchanged) and Italian FS (19 – class 822). Three Italian machine were later taken over by Yugoslavian state railways JDŽ (class 61, later re-classed 150). According to EDÖ, certainly the most competent reference, nine machines have been preserved in the Czech Republic (in mid-2006 three of them were kept in working order), plus three more in Slovakia. Two examples are in Austria and one in Slovenia. After WWI, Poland received thirteen (according to lists available at www.pospichal.net/lokstatistik) engines of this type, classed TKh12. All of them, except TKh12-1, were of the later version with elevated boiler; the latter machine was withdrawn as early as 1923, so its service number was in fact assigned only formally and many sources give a total of twelve examples. Most came from various local railways within Polish borders after 1918. Apart from the above-mentioned TKh12-1, they served with PKP until 1939. Few details on their service record are available; most probably all were used in southern Poland on local lines. Two served with the Kraków-Kocmyrzów local railway (nationalized and incorporated into PKP in 1936), for which they had originally been built, in mixed traffic. Another two ran between Tarnów and Szczucin (former Lokalbahn Tarnów-Szczucin, or LTSz, operated by state railways KkStB and taken over by PKP in 1918); with increasing freight traffic they turned out to be too weak and were withdrawn in 1931. According to a very interesting Internet source (http://republika.pl/derela – in English! 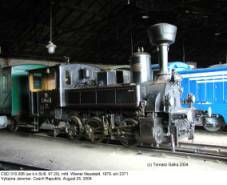 ), at least two class 97 locomotives were armored in late 1918 at the Zieleniewski factory in Cracow. One was later used with the P.P.17 ‘Saper’ armored train; unfortunately, service number of this machine is unknown, but it is an interesting conjecture that it might be the intended TKh12-1, which would explain its early withdrawal. The other was the preserved TKh-6322. As far as I know, TKh12s regained after WWII did not return to PKP, but were used by various industrial operators. 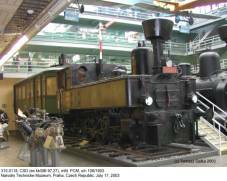 Most, perhaps even all, of them retained the TKh designation, supplemented by serial number – this was a common practice with locomotives used in industrial establishments. Mention must also be made of two ČSD engines: 310.0123 (ex 97.234, Krauss Linz 5128/1904) and 310.0127 (ex 97.241, Krauss Linz 5366/1905), taken over from DRG in 1945 and erroneously designated TKh100-17 and TKh100-18, respectively; they were returned to ČSD in 1948 after little, if any, service in Poland. TKh-6322 (ex KkStB 97.254, Krauss Linz, 6322/1910), pre-war TKh12-12, is the only surviving example in Poland. 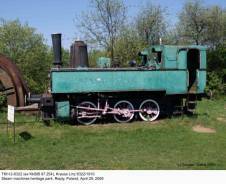 It served with the Borki-Grzymałów local railway, saw some armored service after WWI (with at least one armored train, the ‘Śmiały’), later went to a colliery and can now be seen on static display at the steam machines heritage park in Repty, near Tarnowskie Góry. 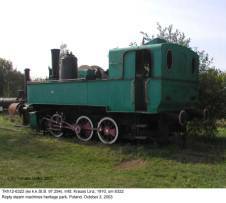 It is noteworthy that, from once large family of ex-Austrian locomotives, only four standard-gauge engines have survived in Poland until today. - Monographic article on the Tarnów-Szczucin railway by Ryszard Stankiewicz (SK vol. 11/2014).